You can stay in a hotel in Cambridge and still get to Boston easily—if you plan properly. Here are the best Cambridge hotels by area, with transport recommendations. 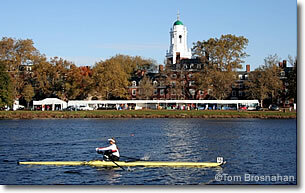 Cambridge, Massachusetts, just across the Charles River from Boston, has its own collection of fine hotels. The MBTA subway's Red Line trains connect most of these hotel areas with downtown Boston (Park Street Station on Boston Common, and South Station Transportation Center), making it possible to visit both Cambridge and Boston easily from your Cambridge hotel. Rower on the Charles River in Cambridge MA.